LakersGround.net :: View topic - Any Interest in Nikola Vucevic? Posted: Sat Dec 29, 2018 10:17 am Post subject: Any Interest in Nikola Vucevic? 28 yo, 7.0 ft, 240lb Magic Center who is currently making $12mil/yr and is a FA after the season. With all (3) Lakers Centers (Zubac, Chandler, & McGee) also FA's next year, might be worth a look. Yes, just isn't as high on priority. Frankly, we had Vucevic -ish in Brook, and didn't keep him. Yep. Vuc is like Lopez on steroids, though. Oh, and he actually rebounds. I would take him if we can't get Kawhi or Davis. I think Orlando Magic would be making a huge mistake by not trading Vucevic this coming trade deadline unless they plan to resign, which is doubtful since they just drafted Mo Bamba. Better to trade him now while his value is highest than let him walk in the summer. However, my opinion is that Lakers should not give up assets this to acquire a player this year as they need to hoard assets for a potential Anthony Davis trade. Talked about this a bit on other threads, but I agree that the Magic should move Vuc. They are too invested in Bamba and it doesn't make sense to turn around and give big money to Vuc. They should move him and get what they can. As well as he's played, they could possibly get a 1st for him, or a young prospect or two with potential. Regarding AD specifically, I also wonder if the Pelicans would have interest in Vuc (and signing him with his Bird rights in tow), though I suppose they might just blow it up if they move Davis. The Magic last made the playoffs in 2012 and are in the hunt so far this season. If I am an owner I prefer the excitement and attention, as well as the playoff revenue, over the Laker’s flotsam. Unless they want to include Ball or Ingram or Kuzma. Would be ready to challenge for the title! You have to give up Ball if you want to sign Kawhi. Vucevic caphold is around 19 million. Correct, the salary cap gymnastics of having Vuc would be roughly the same as if you trade for Kemba. So the decision is Orlando's to make if they want to make a playoff push and keep Vucevic to help that cause or capitalize on assets by trading Vucevic. Either way, I don't want the Lakers to give up assets in a trade for anyone this season. Lakers should trade KCP and other low value guys to get additional assets themselves. Lakers should have about $36 million in cap space to sign a free agent this season. Why do they have to trade Ball to sign Kawhi? That was under the assumption that you traded for Vuc and had his caphold on the books during free agency. It would be very similar to if we traded for Kemba and had his cap hold: basically, if you eliminated Ingram and Lonzo's salaries, you'd still have the Kawhi-level max available along with having the cap hold. Got it, thanks for clarifying. I still wouldn't trade for either Vucevic or Kemba this year but would keep all of our assets for a potential Anthony Davis trade. I can understand that logic. Although if we knew AD is available before this year's deadline, I would for sure be checking to see if the Pelicans somehow prefer someone like Vuc, or Beal, or Kemba as preferable to what we could currently offer them. The Spurs preferred the "let's get an All-Star, even a pricey one, instead of all young players" route, and maybe the Pels would, too. Though if they did prefer that, you'd think they'd want a good player with multiple years on their deal left, and that would mean someone like Beal, not Kemba/Vuc. If their slide continues, you'd have to think that they are going to be receptive to moving Vuc, if they already weren't before. I don't think we would have to give up an asset like Lonzo or Ingram for him, as he's an expiring player with just a few months left before hits free agency. Still, he's played so well that I do think a first round pick or a commensurate young player may be in order. So how about this? We save them nearly $5MM in the trade (prorated), and they get our recent first round pick in Wagner, plus a look at Zu for the rest of the year. I assume they would waive Lance and allow him to try to latch on to a playoff contender. Orlando still gets Wagner here, but Charlotte could use Zubac in the wake of Zeller's injury. Orlando gets a look at Bacon for the rest of the year, and Orlando could also pick up one of the two 2019 2nd round picks that Charlotte owns (via OKC and Denver). Especially with Orlando essentially pulling the plug on this season, Charlotte would love that, as their chances of making the playoffs would go up, which MJ wants. Charlotte may even have interest in retaining Zubac beyond this season on a cheap cap hold, considering that they are likely to let Kaminsky walk (they have apparently been open to trading him) and considering that Biyombo has one more pricey year left. Given that the Magic have a lot of bigs, I'd imagine they'd rather pick up Bacon and a 2nd instead of just Zu. Oh, and remember that Mitch Kupchak drafted Zubac. As for us, yeah, we'd lose Wagner, but I wonder if Maginka would still be satisfied with Bonga and Svi out of the draft, plus the potential that Vuc helps our chances this season AND becomes an option for next year with the cap hold. If the FO can't land one of Kawhi, AD, Kyrie, Klay or KD... I think the next best thing to do would be to sign Vucevic and a starting shooting guard (such as Brogdon, or whoever is the best 3&D shooting guard we can get for 12m. They need to be able to defend Klay/Kawhi/Harden type of players, which KCP can't do at all). Lebron, Ball, Ingram, Kuz, Zu, Hart, Wagner, Svi, Bonga, Deng = 69.15m. Add Vucevic's 19.13m = 88.28m. Brogdon is an RFA, we offer 12m and if we get him = 100.28m. Sign McGee using the Room MLE of 4.67m, this is the 12th spot so removes all incomplete roster charges... which then leaves 8.72m to offer Rondo. If Lance is willing to sign for the Vet-Min, I'd also do that. I'd be well pleased with this squad TBH. I was comparing the stats of Vucevic and Cousins - Cousins from last year pre-injury, and Vucevic this year - and V-Man actually looks pretty good. Cousins has been better over his career, but what he did pre-injury may not matter as much now. On a lot of key stats - 3PT%, Rebound %, TS%, DBPM - Vucevic measures out close to or a little better than DMC. Lower usage rate too, which I'm hoping means he would fare better playing with a high-usage player like Lebron. Vucevic may cost more than DMC - either in $$ or years - because of Cousins' injury. (bleep) I have interest in Vucevic. We better end up getting one of these gentlemen. I differentiate it like this. Value above Max (Superstar) - KD, Kawhi, possibly Kyrie. These are the guys that are probably worth more than the Max. Max Value (Consistent All Star) - Klay, Kemba, Butler. Probably should be 90% of Max deal but market dictates they get the full Max. Borderline All Star - Tobias Harris, Khris Middleton, Vucevic. Probably should be 80% of Max deal but market might dictate they get the full Max. Vucevic might fall a tier below at 70% because he plays C, which is losing its importance in modern NBA. Like most sports, contracts are being split between max and minimums/exceptions. The middle class is going away. I'd rather have TWO of these guys than one Superstar to pair with LeBron: Tobias Harris, Khris Middleton, Vucevic. I like. Vic, h can shoot outside better than anyone on our roster and is a good rebounder. If we miss on the other big signings, I like him as a Kevin Love like player. If the Magic will do a S & T for Vucevic (For Zo, Hart and either Kuz or Ingram) I'd do it, they may take that over letting him walk..
Then I take the excess cap money and throw it at Kemba. 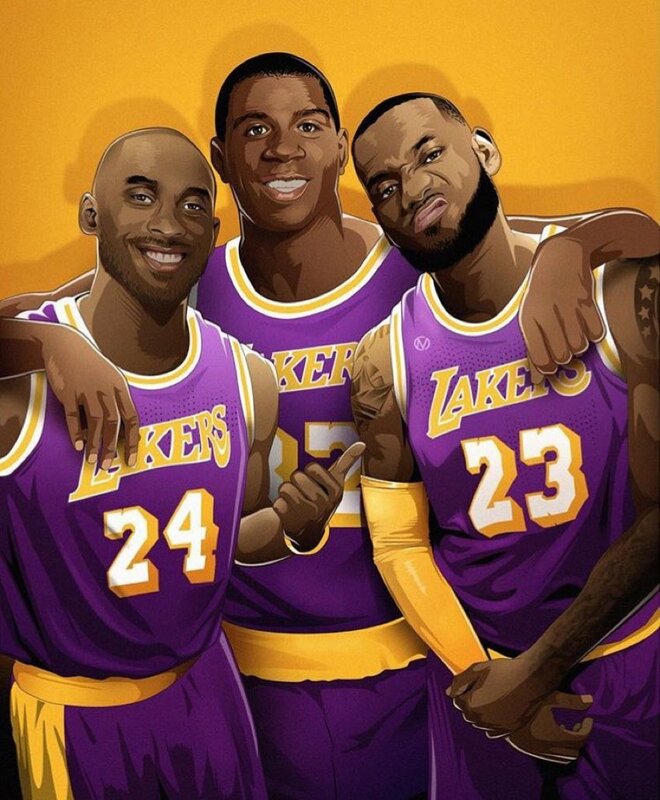 And the Lakers suddenly have a BIG 3!